The winner of Week 5's Sunday Million had five players under 14-percent owned. Pinpointing players who return great value but are low-owned is key to taking down large tournaments. Every week, I'll be throwing away money entering a bunch of cheap Thursday GPPs on FanDuel with as many relevant players as I can, because FanDuel allows users to see ownership percentages of any player they roster. To get an idea of the ownership percentages on other sites, we'll have to extrapolate the FanDuel results (and also account for pivots from the Thursday plays). Use common sense: if players have a large discrepancy between their FanDuel price and whatever site you're playing on, obviously you have to take that into account. Remember that FanDuel is 0.5 PPR, so pass-catching running backs may be more popular on full-PPR sites. Also note that these lineups are from Thursday nights, so if injury news has broken since, it can change things up, especially for other players in the same salary range as the players affected by injuries. Furthermore, remember that these percentages come from small stakes contests; in higher stakes, the gap between the most popular plays and the less popular ones may not be as great. Finally, keep in mind that when Thursday plays are taken out of the equation, the rest of the players may not necessarily simply see proportional increases in ownership -- it's very possible that one player will see a disproportionate increase compared to the rest of the pool. Predicting ownership is more art than science, and this is by no means a perfect system. However, by looking at a ranked list of ownership percentages on a popular site like FanDuel, we can get a decent picture of how the consensus feels about all of the different plays in a given week across the industry. I leave the Thursday players in the list for reference purposes, and I write a few thoughts about what I think may change on Sunday (if anything), but generally, I will not be providing actual picks here. For those, check out my FanDuel GPP Breakdown and DraftKings GPP Breakdown (published weekly on Friday), which both heavily take the information gleaned here into account. Note: This week's contest was FanDuel's $1 Mini Dive. 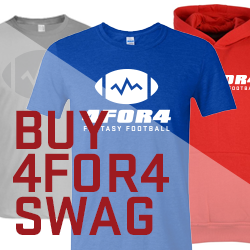 Editor's Note: 4for4 has an ALL-NEW DFS SUBSCRIPTION! It includes our revolutionary Lineup Generator, Stack Value Reports, Ceiling & Floor Projections, GPP-Specific Articles, Ownership Outlooks, DFS Theory Articles, Lineup Construction Articles, a Downloadable .csv with Projections and Salary Data, and much more! DETAILS HERE! Previous subscribers don't worry, you'll get the same DFS content you got last season, but we think you'll want to UPGRADE to our DFS subscription because it takes our DFS content to the next level! No surprise here -- Brady is the consensus top value in a game where the Patriots have a team total of over 30. There's a lot of ownership to make up with Freeman off the table Sunday. Expect Dion Lewis to be the most popular option, with the studs (LeVeon Bell, Matt Forte, Adrian Peterson) making large jumps. Again, a Patriot tops the list. Allen Robinson has overtaken James Jones as the most popular play under $7,000. It looks like Antonio Gates may be the highest-owned player on the slate this Sunday. Users are down on Gronk after two scoreless weeks. No suprises here, with the Patriots huge team total making Gostkowski the most popular choice. The Broncos and Jets are the two best projected values at defense, so it's no surprise they top the list. The Titans are in third place a users target the Dolphins' brand-new head coach.